Facebook is set to debut a brand-new set of premium ad units that will defy conventional online advertising formats. Fast Company reported on the social network’s bold departure from the digital norm. These new ads will have a social skew, which means that they’ll include “like” buttons and comment boxes, as well as show pictures of friends who have “liked” the brand. Any user activity on the ad will be posted to the user’s friends’ news feeds and also be posted to the brand’s page. 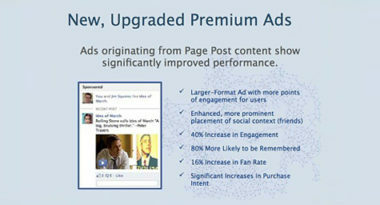 The ads will also forgo traditional ad copy in favor of content taken directly from posts on Facebook brand pages. While Facebook has refrained from discussing the new ad units, documents show that the social network will replace all previous ad units with this new format, which integrates social and interactive elements much more thoroughly. The six new ad units will be based on the content a brand would post to their page, with documents referring to the different formats as Status, Photo, Video, Question, Event, and Link. Facebook believes that these new ad units will benefit brands much more than traditional advertising. Based on internal tests, the new ads produced 40 percent more engagement and were 80 percent more likely to be remembered. Facebook also claimed that the new ads would increase purchase intent by asserting that users were four times more likely to buy brands recommended by their friends. The new ad formats are certain to be a topic of much debate among marketers and brands and are likely to be addressed at the first fMC, a Facebook event specifically for marketers on Wednesday, February 29 from 12:00 p.m. to 6:00 p.m. Don’t miss this opportunity to join fellow Facebook leaders, along with product and marketing experts, to discuss strategies and solutions for leveraging social technology for business growth. This is an invitation-only event, yet will be broadcast live on this site. To learn the latest social media marketing strategies, contact MDG Advertising today at 561-338-7797 or visit mdgadvertising.com. MDG Advertising, a full-service Florida advertising agency with offices in Boca Raton and New York, NY, specializes in developing targeted Internet marketing solutions, exceptional creative executions and solid branding and media buying strategies that give clients a competitive advantage. Our core capabilities include branding, logo design, digital marketing, media planning and buying, TV and radio advertising, customer relationship management, video marketing strategies, inbound marketing programs, public relations, Web design and development, email marketing, infographic design, social media marketing, local search and SEO. View MDG Advertising’s creative marketing portfolio.